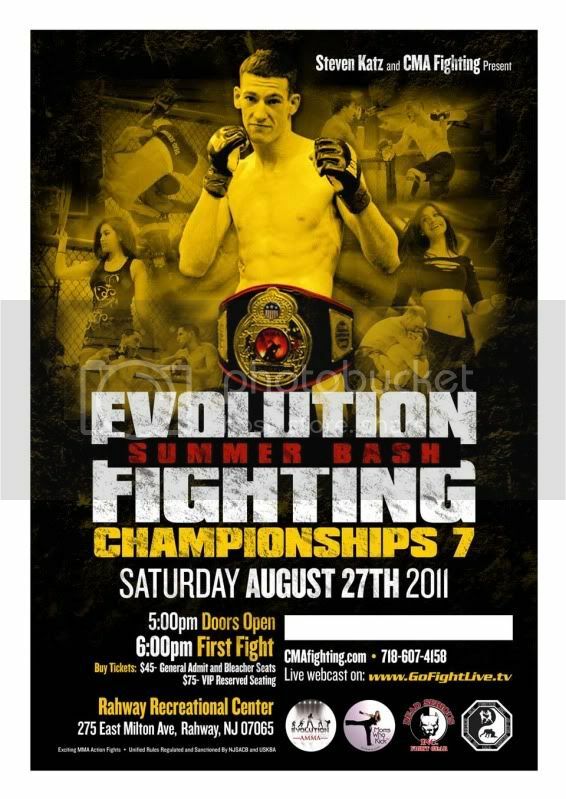 Steven Katz, one of the best dressed men in MMA, is promoting Evolution Fighting Championships 7, the Summer Bash, on August 27 in Rahway, New Jersey. Evolution is a promotion that puts on great amateur MMA bouts in the Northern, NJ area, close to NYC. If you are a New York fight fan, it doesn't get any better than this. Ben Syers will be defending his Evolution title at this show. You may remember Ben from his 4 second knockout at his last Evolution fight, the video of which went viral on the Internet. I assume Ben is looking for a 2 or 3 second KO this time out, to one up himself. And he might just get it. Steven Katz knows how to put on great cards, and you can be sure that this event will be stacked. We'll have lots more on Evolution Fighting Championships in the coming weeks, so stay tuned!